Wakura Onsen has a history of 1200 years and is the country’s leading high-end hot spring town. We introduce here some of the places where you can experience the charm of this area with your five senses. The country's leading hot spring town with a history dating back 1200 years, Wakura Onsen is a long-standing hot spring resort that faces towards Ishikawa’s Nanao Bay. Exactly what kind of charm does Wakura Onsen hold? Here you can experience the true pleasure of traveling in Japan through your five senses. In order to reach Wakura Onsen from Tokyo, take the Hokuriku shinkansen to Kanazawa Station. The ride takes about 2 hours and 30 minutes. From Kanazawa Station, you can either take a train to Wakura Onsen (the ride takes one hour), or a local bus (one hour and 50 minutes). From Osaka, you can reach Kanazawa Station in about 2 hours and 50 minutes by using the Thunderbird express run by JR West. When speaking of Wakura Onsen, what first comes to mind are its hot springs. 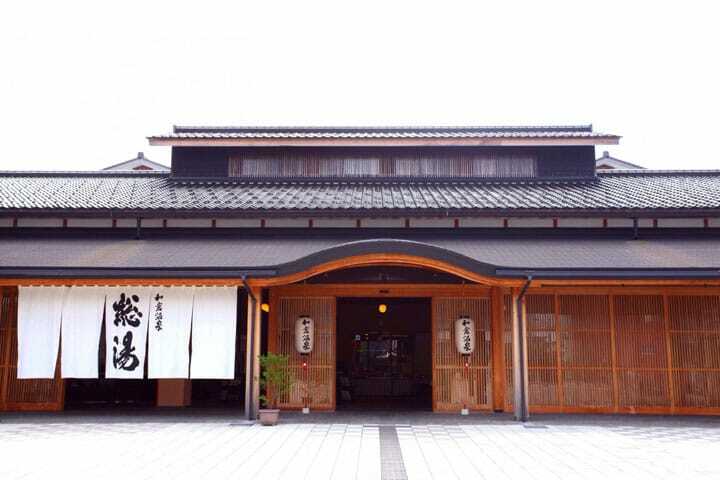 The high-quality springs, considered to be good for rheumatism, nerve pain, gynecological diseases, atopic dermatitis, and other conditions, are Wakura Onsen’s treasures. In the heart of this hot spring town is a monument called the “Hot Water Reservoir of Wakura” which commemorates the spotting of a heron resting in the ocean that led to the discovery of the hot springs. From the monument, we can understand how indispensable the hot springs are to the town. The water from the springs is also safe to drink when correctly prepared; the springs are good for gastrointestinal disorders and anemia when diluted twice, but are naturally at the very high temperature of 92 degrees Celsius, so those wishing to drink this water must wait for it to be cooled. However, the heat from the water can be used to boil hot spring eggs. Purchase eggs from the nearby supermarket, place them in the basket provided, and wait about thirteen to sixteen minutes. The eggs, when boiled in the hot water spring, will have a slightly salty taste. Wakura Onsen Soyu is also located in town and can be visited during a day trip. Wakutama-kun, Wakura Onsen’s mascot, will greet you at the entrance. There are various hot springs at Wakura Onsen Soyu such as warm baths, hot baths, standing baths, open-air baths, saunas, and cold baths, where you can enjoy concentrated fountainheads constantly gushing with active ingredients much loved by hot springs enthusiasts. Nearby is a free footbath called Yuttari Park Tsumakoibune-no-Yu where you can relax while gazing at Nanao Bay. This footbath, where you soak your bare legs into the hot springs, is popular as one you can readily enjoy while taking a break from exploring. Several years ago, Nanao Bay became the home of wild dolphins. Dolphin watching on board boats or swimming with the dolphins through dolphin swimming and snorkeling tours can be enjoyed here. Shrines and temples are located here and there in the town and exploring them is one way to enjoy yourself. The “Seven Lucky Gods Pilgrimage”, where one will receive good fortune after visiting the various locations associated with the seven gods said to bring happiness, is especially popular. If you are looking to enjoy the atmosphere at Wakura Onsen, then there is no better place than Togetsuan. Togetsuan is Wakura Onsen’s oldest structure. Built in the year 1915, it is a beautiful wooden building that utilizes Japan’s residential architectural style called the sukiya-zukuri. Sukiya-zukuri in turn is based on the style of teahouse buildings. Not only is the building’s exterior beautiful, the interior was left as it was originally constructed at the time of its erection. You can fully enjoy architectural techniques unique to Japan from indoor carvings and more at Togetsuan (only guests and organizations using the dining facilities are allowed indoor access). At night, the inn will light up and envelop you in a dreamy atmosphere together with a beautiful image that is like a dream reflected on the water’s surface. Other areas in the town of Wakura Onsen aside from the aforementioned Benten Shrine, Hot Water Reservoir of Wakura, and Togetsuan include Sukunahikona Shrine and Serin-ji Temple, which also light up at night. You can witness scenery while on a walk out in the night air that is different from the town’s visage in the daytime. “How much you enjoy a trip is determined by the meals!” It’s no exaggeration to state that the meals really do influence your impressions of your lodgings. At Wakura Onsen, you can enjoy fresh seafood caught in Nanao Bay around the corner or in the neighboring Toyama Bay to your heart’s content. Noto-zukushi that uses Noto’s seasonal fish as its main ingredients is a popular dish at Janome-zushi. You can also enjoy other delicious seasonal ingredients including rare veined rapa whelk (in season from June to August), known to only have a daily yield of several kilograms in the Nanao Bay area, the Noto Japanese amberjack (in season in the winter) which is said to be the most delicious amberjack in Japan, and meaty brand-name Noto oysters (in season in winter) that are tightly packed with flavor despite their deliciously small sizes. When you want to eat with gusto, then gulp down a donburi (rice bowl) at the donburi-specialty shop, Noto Kaisen Don Mitone. The thick, large pieces of sashimi together with rice will fill your mouth with happiness! Aside from the much-recommended Noto Kaisen Don (1900 yen), there are a variety of donburi available here, such as the Seasonal Fish Mitone Don (2800 yen) heartily topped with delicious Noto ingredients or the Broiled Nodoguro Don (2000 yen, available during the end of May to middle of September) that uses nodoguro (rosy seabass) cultivated in Noto as a topping and is characterized by its light, yet rich flavor. Izakaya bar-crawls after soaking in the hot springs is another expert way of enjoying the hot springs town. Many izakaya offer fresh seafood that is exceptional and pairs well with sake as a side dish. It’s also great to have oden with a clear, light dashi stock from Machiko’s when your body is feeling chilly after taking a bath. Wakura was once a port stop on the Kitamaebune shipping route (*1) and was the originator of creating dashi stock from kombu being transported on that route. This oden is one to savor while thinking of that eternal flow of time and its deeper meanings. *1 Kitamaebune shipping route: a westward marine route that existed from the Edo to the mid-Meiji period, that traveled from Osaka through the Seto Inland Sea, San’in, Hokuriku, and Tohoku regions before arriving in Hokkaido. It had been an important traffic route for early modern distribution. Naturally, there is also a full selection of desserts. At Le Musee De H, you can enjoy the finest quality sweets made by patissier Mr. Hironobu Tsujiguchi, an Ishikawa local, while gazing at Nanao Bay. If you would like to reasonably enjoy yourself, we recommend purchasing the Sweets Tour Plan (comes in a bundle of three tickets for 500 yen) at the front desk of your accommodations, the Wakura Onsen Tourism Association, or the Wakura Jiban-kan. You can visit and choose up to three sweets from various shops in the Wakura Onsen district with these tickets. Lastly, we will introduce an inn called Kagaya. Although Japan’s high-level of hospitality has continuously been praised by the world, Kagaya has consecutively been chosen as Japan’s best inn for 35 years out of 100 top Japanese hotels and inns, as selected by professionals. Even inns and hotels from around the country visit to learn superior hospitality techniques and more from these service professionals. The inn has friendly and extremely thorough hospitality, an open-air bath with an optical illusion where you’ll feel like you’re wafting through Nanao Bay, a festival theater where you can enjoy free shows, and a souvenir area where famous local products and handicraft shops are all lined up in rows. There is no way you can grow tired of this theme park-like inn! Enjoy Your Stay at Wakura Onsen! Hot springs, famous landmarks, delicious food, and the spirit of hospitality. If you are visiting Japan, we would definitely like you to experience Japan in the town of Wakura Onsen which is jam-packed with all kinds of activities. How about setting your five senses free and fully experience Japan in this profound hot spring town embraced by the calming sea? Four Tourists Take A Tour Of Wakura Onsen!